Joel Chianese is a young footballer making an impact. An up-and-comer in the Sydney FC squad, Chianese has put in the hours on and off the park this season to earn a starting spot up front. His story is one of commitment, resilience and a balanced perspective. In an EXCLUSIVE one-on-one, Anthony Siokos chats with Chianese on life, love and football. At first glance, Chianese appears humble. Perhaps, it’s the 23-year-old’s modest upbringing in Sydney’s West, or his sense of family. Maybe it’s because he almost didn’t make it as a professional, or at all. Whatever it is, it’s deeply intrinsic. The son of an Italian-Australian father and Anglo-Australian mother, Chianese was by no means destined for football. His father played rugby league and had no real ties to the round ball game. Nevertheless, at the age of five, his parents took him to the Wenty Waratahs Football Club (all kitted out) to register for the U6s. He hated it, but one year later, something had changed. His father had encouraged him to give it a go and he never looked back. “My Dad got me going. He would always tell me to practice with both feet. Left and right, left and right. I think that’s why I’ve always had the confidence to receive the ball in any situation on the park,” said Chianese, with a reminiscent smile. It’s clear how close the young striker is to his family. He spent his childhood growing up with his paternal grandparents, as both parents worked full-time. They migrated to Australia from Italy in 1956. He quickly learned to speak fluent Italian and embraced the culture. Chianese left the Waratahs at age 11 to join the Granville Magpies, while playing tennis in his spare time. He was really enjoying his sport, as many Australian kids do at that age. Thankfully, he stuck with football. Life as a teenager out West was fun. However, things got unexpectedly serious when an injury at a State Championship in Wagga Wagga left him in toxic shock, hospitalised and isolated for two weeks. He’d received a studded tackle to the back of his leg, which left a nasty cut. He thought nothing of it until he started to feel ill, shaking, with a tingling sensation in his fingers and toes. His whole body went tomato red. He was diagnosed with Scarlett fever. As he hit his mid-teens, he was selected in the Big Brother Movement, a scholarship program assisting school-leavers to develop their skills in Britain and Europe. He was sent to Ipswich Town Football Club. The game, all of a sudden, became a professional career aspiration. When back in Australia, his fresh approach led him to selection in Blacktown City’s youth team. By then, he’d finished school and started working for the NSW State Parole Authority, in an administrative role. Later moving to the NSW Department of Lands, where a promising office bound career was starting to take shape. He kept at it, and after trialling well at Sydney FC, was contracted to the youth team. It was Vitezslav Lavicka, then Sydney FC coach, who took a liking to Chianese after watching his progress. Sydney FC coaches, Frank Farina and Rado Vidosic, have given Chianese the opportunity to earn his place in the starting 11 this season. Competition for places in attacking areas is tough at the Sky Blues, and a move from his natural striking position to a place on the wing has been a transition. Alessandro Del Piero has acted as mentor, giving advice and spurts of motivation at training and during matches, particularly on how to be clinical in front of goal. According to Chianese, your football should speak for itself. Away from football, Chianese spends most of his time with high school sweetheart, Corinne. They’re both into R&B and hip-hop, with Usher, Pitbull, Eminem, and DJ’s like David Guetta and Havana Brown among their favourites. Chianese doesn’t like to think too far ahead. Although, with some encouragement from Professional Footballers Australia (PFA), he’s completing a Diploma of Business (Management) with teammates, Rhyan Grant, Matthew Jurman and Vedran Janjetovic. 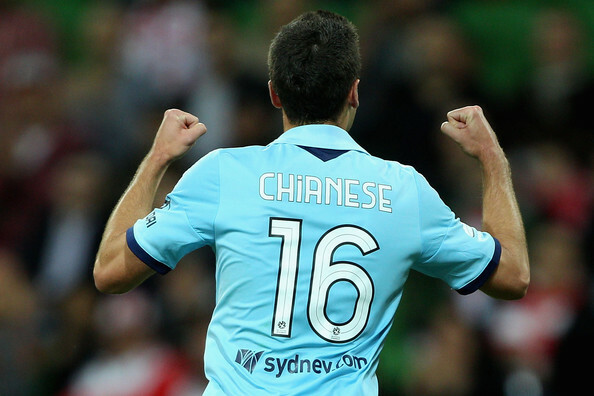 For now, Chianese is focused on putting in a good shift for Sydney FC every week. Some have compared him to former striker and Socceroo, Alex Brosque. He’s got the potential, and is committed to playing his part in what will hopefully be a successful season for the Sky Blues. Two feet are firmly planted on the ground.